Please call 603-695-2628 to sign up for informational classes. Elliot Health System is committed to helping patients live healthy and active lifestyles. The Bariatric Surgery Program provides the surgical and peri-operative support services patients need to achieve significant weight loss and health improvement. 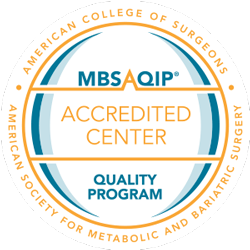 Elliot Hospital was surveyed by and accredited by MBSAQIP as a Comprehensive Bariatric Center. Our highly trained and experienced surgical team offers the latest advancements in the field of bariatric care with a strong focus on patient-centered care. Surgeries are performed using the most modern facilities, techniques, and technologies. After surgery, the greatest care is taken in ensuring that each patient receives the highest standard of follow-up care in a supportive environment. Bariatric surgery can be a viable option for eligible patients that need to control other medical problems such as diabetes, hypertension, and cardiovascular disease, among others. Along with a healthy diet and regular daily exercise, weight-loss surgery can provide effective, lasting relief from these health risks. The Bariatric Surgery Program has been a successful collaboration between Elliot Hospital and Dartmouth-Hitchcock Manchester under the direction of David Gould, M.D. treating patients throughout northern New England since 2002.